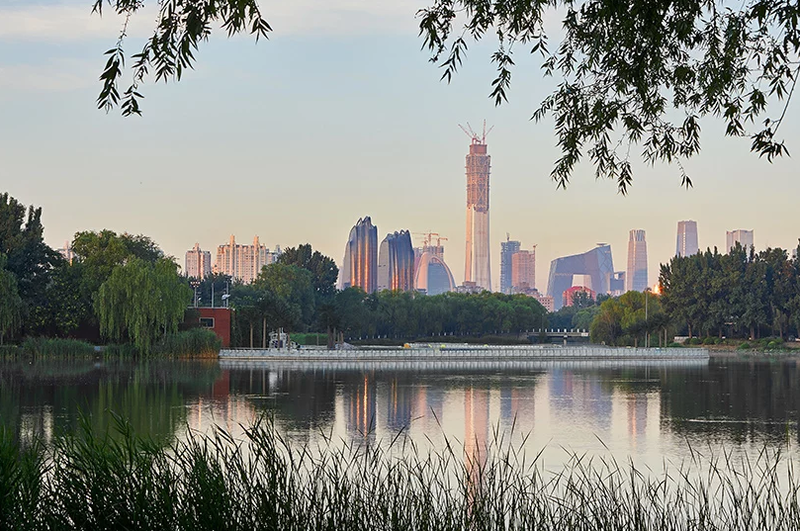 MAD architects, the Chinese firm led by Ma Yansong, has completed ‘Chaoyang Park Plaza’ on the southern edge of the largest park in Beijing’s central business district. The development includes the 220,000 square meter ‘Armani apartment complex’, which comprises ten buildings that have been designed to ‘unfold as a classic Shanshui painting on an urban scale’. the project — which broke ground in 2014, before topping out the following year — has been conceived as extension of the park within the city. ‘we want to blur the boundary between nature and the artificial, and make it so that both are designed with the other in mind,’ explains Ma Yansong. The development’s overall environment is shaped by smooth, curved surfaces that seek to evoke the emotion and aesthetic resonance of a traditional Chinese ink painting. the landscape that weaves itself in between the buildings incorporates pine trees, bamboo, rocks, and ponds — all traditional eastern landscape elements that imply a deeper connection between the architecture and classical space. meanwhile, Japanese graphic artist and curator Kenya Haraled the design of the project’s signage system.